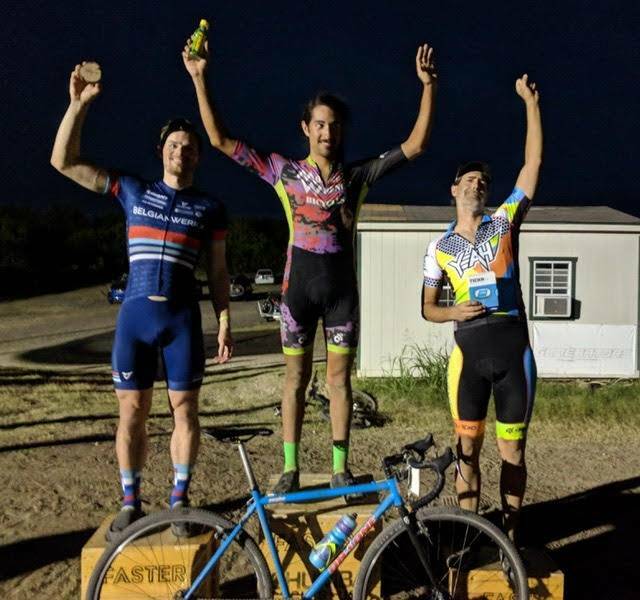 I was finally able to get back to racing after a couple month break as my family and I moved to Austin, Texas. 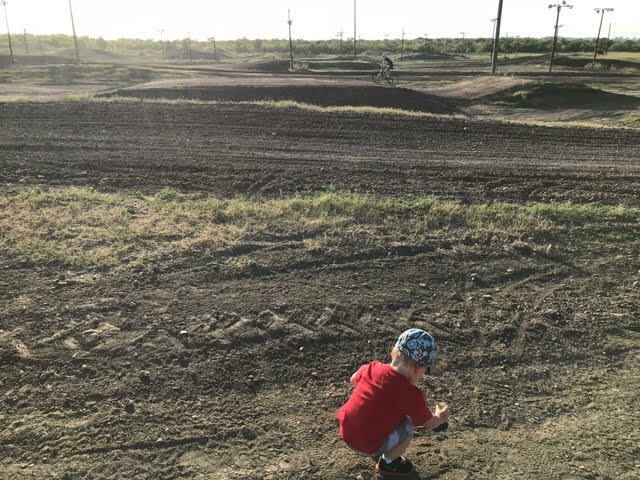 I decided to jump in on the last Hell-X series race which is a short track/cyclocross race at Austin-Del Valle Motocross Park. It is actually a really neat venue to hold a race with opportunities to catch some air on the dirt mounds. There are two races and the first race occurs during the hottest part of the day but is much shorter. I opted for the short race because I wasn’t sure how my body would react to racing in the heat but also my wife, Laura, and my son, Isaiah, were coming to watch me and the second race was way past Isaiah’s bedtime. After a few warm up laps and drinking almost a gallon of water/Nuun before the race, I lined up. There were no call ups so I just went right to the front. The start of the race was kicked off by some fireworks that actually started the grass on fire because of how dry it has been lately. After the start, I settled into 4th place which was exactly where I wanted to be. Halfway through the first lap, the guy on the front broke his chain which moved me up to third. On the second lap, the guy in second was starting to drift so I waited for the long grass section to pass him and catch up to the guy in first place. I stayed in second for two more laps and had picked my place of attack, the run up. The guy in front was dismounting and shouldering his bike while I was only pushing my bike up because it wasn’t that long of a run up. Here I was able to carry more speed going into the run up and quickly get back on my bike because I didn’t need to take it off my shoulder. Twice, I could have passed him but held back because I didn’t want to overdo it in the heat. Then came the fourth lap and the heat got to me. I had up to this point picked out two spots on the course to drink some water, but I was almost out so I had only been taking small sips. I started having the signs of heat exhaustion. First, I had stopped sweating, then I got goosebumps, and twice I almost went off course by spacing out and I had started to fade from the guy in first. As I looked back, I had a really healthy lead over third place so rather than focusing on staying with the guy in first, I held my own healthy pace in the heat and was able to bring it home for second place. Immediately after, I drank probably another gallon of water while sitting on my car in the shade. I found my limit in the Texas heat during the Hell-X race and I still have a lot of acclimation to do but they aren’t joking when they say, “Hydrate, Hydrate, Hydrate.” I thought a gallon of water before hand and a bottle during would be enough. I guess you also need to NOT be a Midwesterner that has never experienced 100+ degree heat too.